Doing Valentine’s Mexican Style in a Canadian sorta way…. Oh Man! Bonnie Tyler may have sung, “I need a hero,” but I need a breather! I am actually listening to her as I type and it is pretty intense. A whopping 19 million others have clicked onto this video. I can’t even begin to imagine who they are, but I am sure they are all pretty cool. Happy Valentine’s! I don’t need a superman to sweep me off my feet, but I do need someone to rub them…Sean? He is actually out right now with a dear old friend he has not seen in probably 3 years, but my feet will await, slippers off with great anticipation. Today was a radically fun and dazey day. Sweet friends Ashley and Shaun would understand. We had a quite an evening last night, one in which records were played and talks of God, life, marriage, and pasts. We were all stunned and half asleep when we peered at the time and it whispered 2 AM. Wow. So, needless to say, I don’t have a clue what I packed in 1’s lunch this morning. I don’t know how I even got dressed, but life as a mom is not about standing around and asking questions, it is about getting the things that need to get done, done. I know she went to school with a lunch, what it had in it, I do not recall. Boys 2 and 3 had their haircuts late this afternoon, and as we left the salon, Sean asked what was for dinner. 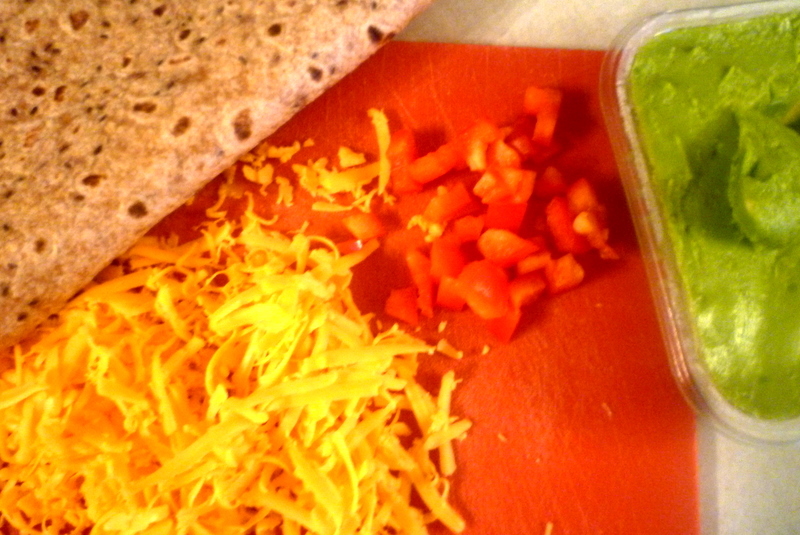 As I glanced at the clock in our car shouting 5 pm, I determined and willed for a spicy warm Mexican Valentine’s Dinner. Mmmmmm. I have been craving this for a week. Unfortunately my organic avocados couldn’t hang in there, so we did without them, but the meal was scrumptious none the less. 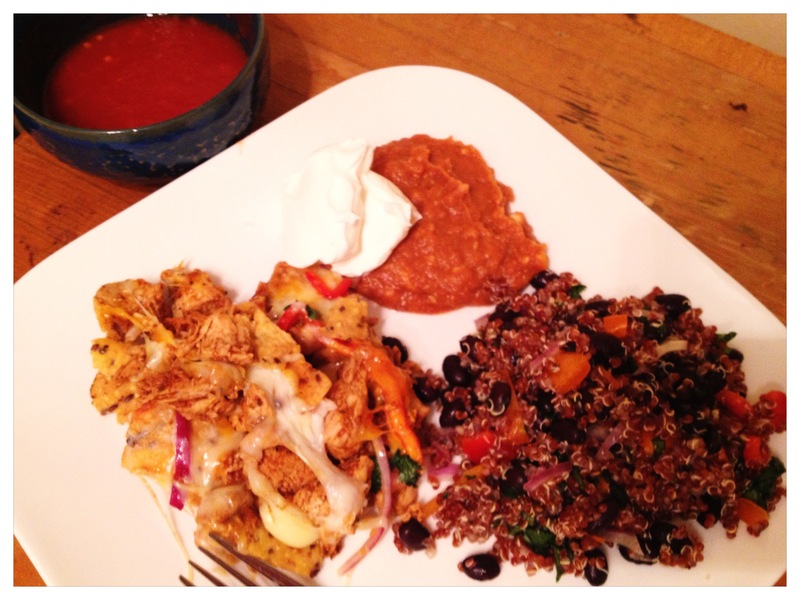 We had 3 Cheese Nachos, Black Bean and Red Quinoa Salad, and cheesy refried beans! Turn oven on to Broil. 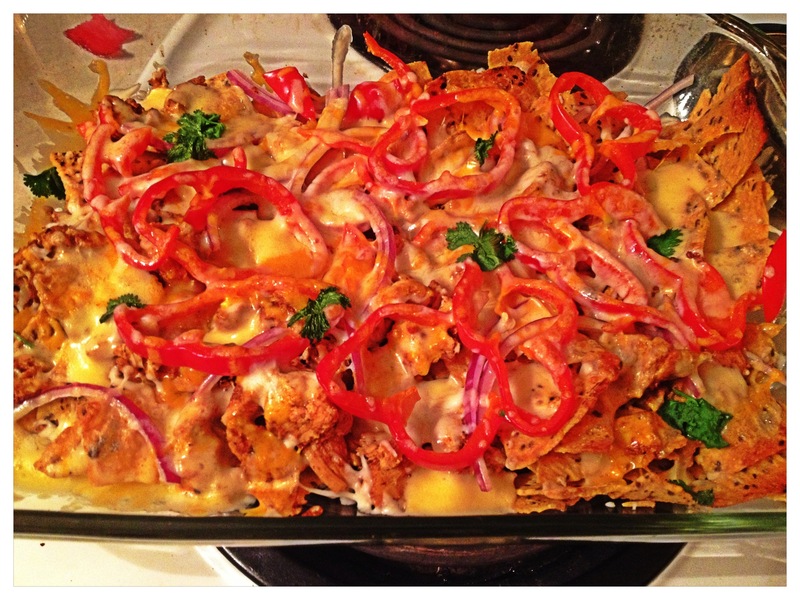 Spread the taco chips evenly in a large 9 X 12 baking dish. 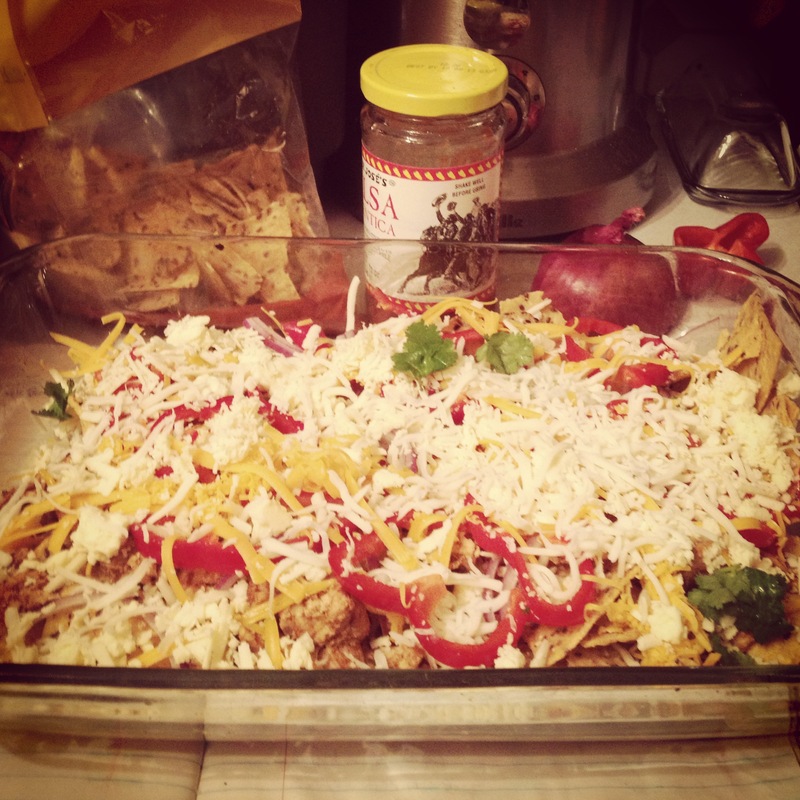 Layer with shredded cooked chicken, peppers, onions, and cheeses. Top with chopped Cilantro. Place in hot oven for 5-10 minutes, checking often to make sure the taco chips don’t burn, but cheese is melted, perhaps even bubbling. I do realize that this may be a lot of cheese, we, or perhaps it is more so me, loves cheese, so please tweak the ingredients to your preference! 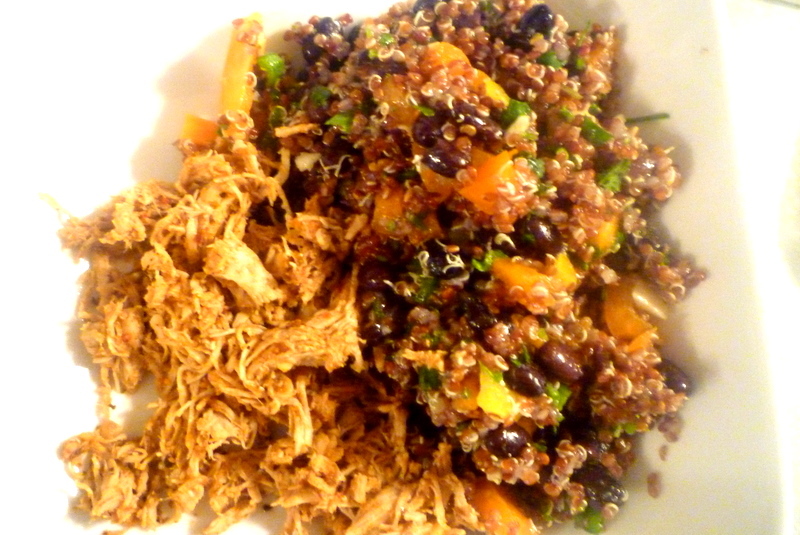 Serve with refried beans (heated with shredded cheese and salt), salsa, sour cream, guacamole, and Black Bean Red Quinoa Salad. I had no intentions on writing tonight, for it has been an extremely draining day. I had planned to finish a book I have been reading, but I cannot find it anywhere. I was reading before 4pm and somewhere between 4 and 6 it has disappeared. I looked in every place possible, including the pantry and the fridge. Like I said, it has been a draining day. I rode in an ambulance for the first time in my life this morning. 3 had put something in his mouth and began to gag then scream. The gagging and choking scared me, so I phoned 911 for help and prayed. They attendants were amazing and Lizzie, too, for taking 1 and 2 to her house, but it was the 5 hour wait in emergency that aged me by a couple of decades. So, since my book is missing and my baby is sleeping in the room next to me, I thought I would share a refreshing meal for a drainer day. 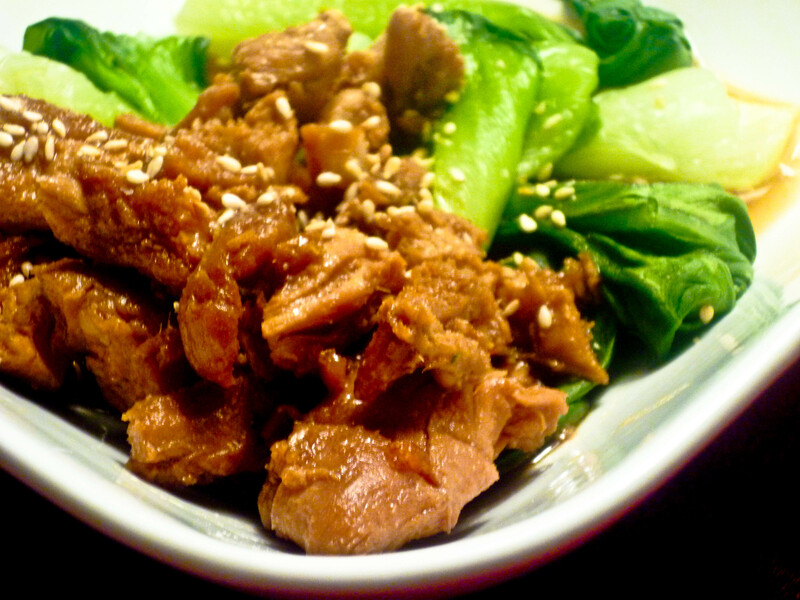 I made this in a blur this evening, but the taste nonetheless brought life to my taste-buds. I am sure everyone, besides McDonald’s has a happy meal they can go to or make, well, this is mine. 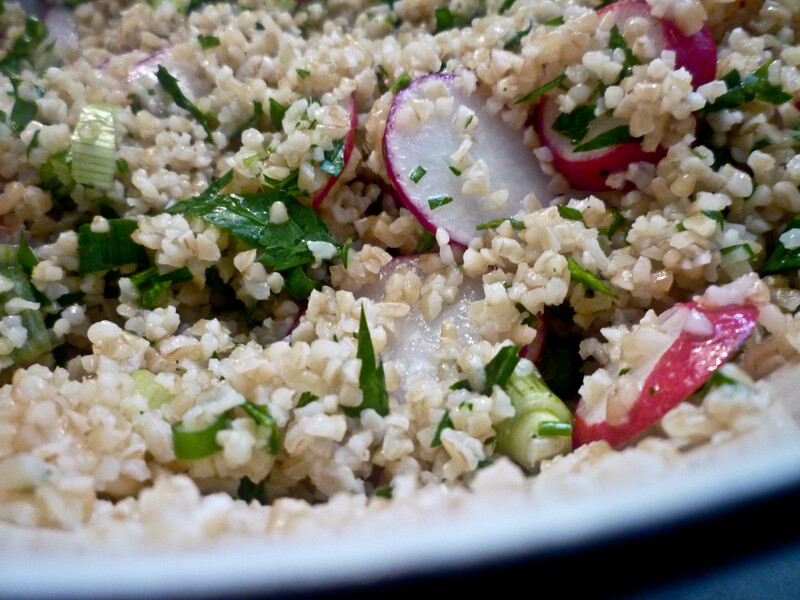 I could eat red radish tabbouleh everyday, especially this one. Turn oven up to 350 degrees. Place chicken in a casserole dish. Pour dressing over top. Cover and cook for 45-50 minutes. Once the chicken is cooked, uncover and let the chicken brown a tiny bit more for about 5-10 minutes.. While the chicken is cooking, bring 1 1/2 cups of water and the salt to a boil in a saucepan. 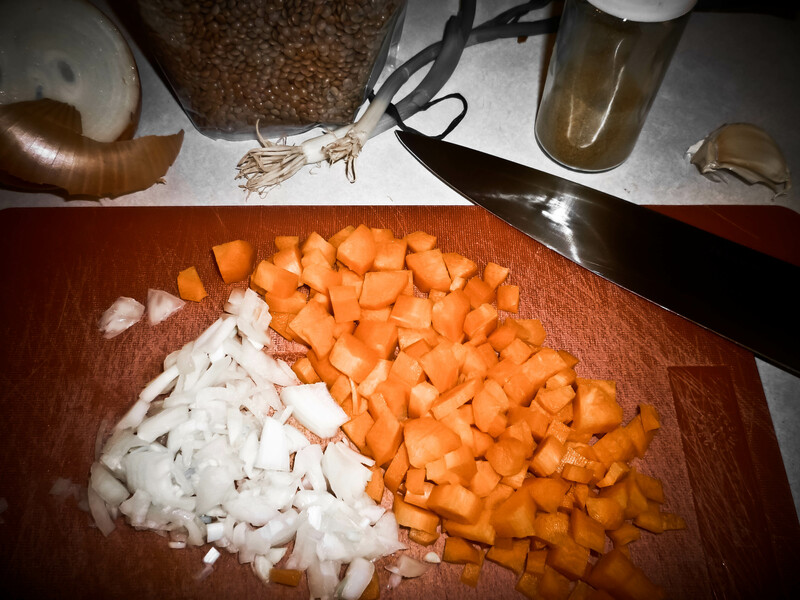 Place the bulgur wheat and boiling salted water in a heatproof bowl. Stir once, then cover the bowl with a plate and set aside until the grain has absorbed all the water, about 20-30 minutes. Stir in the lemon juice, oil, parsley, scallions, and radishes and mix well. Add more lemon juice and salt to taste. I remember the early days of our marriage. I really wanted to be the one to make the meals and to slave all day in the kitchen, like a Mrs. Cleaver type persona. I had it pretty easy when before marriage. I lived at home and was a full time university student. My parents like to order in a lot, so I kind of did too. There were times I was ordering in sushi 3 times a week. Well, that lifestyle changed dramatically when I got married. My quest for food developed later when finances were becoming a burden as well as a reality. I think Sean and I went from eating out 3 times a week to eating out once a month, if that. 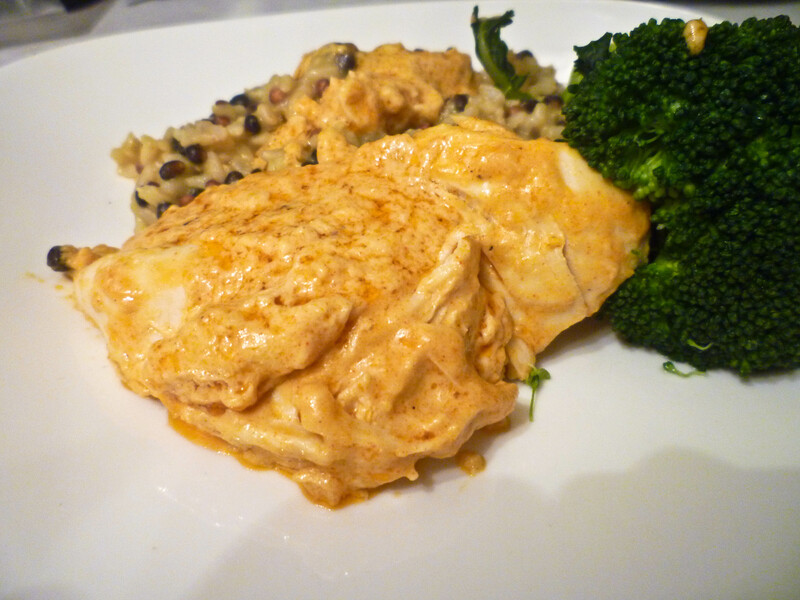 A dish that my mom and I kind of made up together one day, while I still lived at home, is this mustard chicken dish. When I made it for Sean, shortly after our marriage, it became a favorite of his. It is simple to make and tasty to eat. Heat minced garlic in a large skillet with oil. Add chicken breast with salt and pepper sprinkled on it, cook until no longer pink. Feel free to add a bit of water, if it begins to burn, or the skillet seems quite dry. Add sour cream and mustard. Stir in the skillet until well combined and the chicken is well coated. Add hot sauce and cheeses. Stir until all combined, sprinkle in paprika. Serve with broccoli or asparagus and jewel rice (rice medley). Remember that song by envogue? It popped into my head this evening when I came home from shopping at Trader Joe’s. Sean made dinner for us and it was scrumptious. The weather is too cool for my liking, plus add the windchill and the rain, and you have the perfect equation for feet that can’t get warmed. 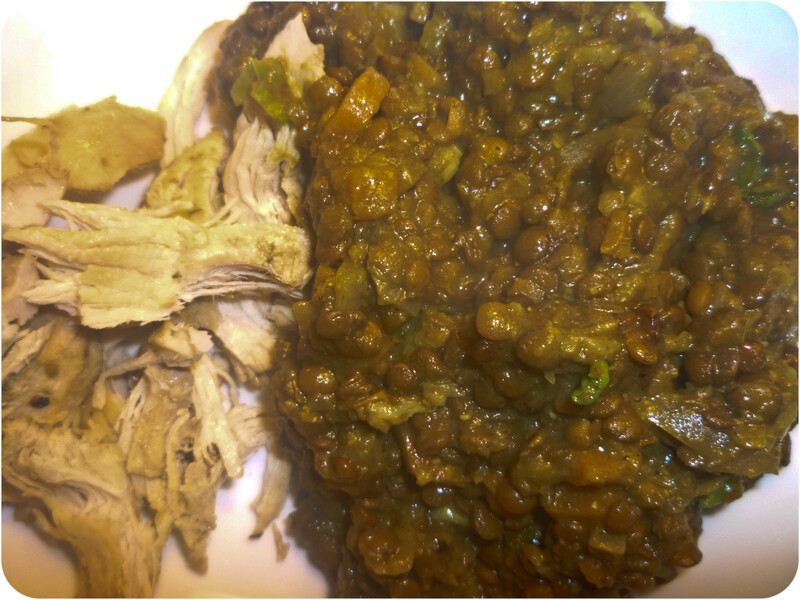 He made a curry lentil dish that not only filled me up, but heated me up. So for those blustery West Coast days, cheers to the wind in more ways than one, and try out this snazzy dish taken from Oh She Glows. I also added leftover chicken that had been marinated in Trader Joe’s salad dressing called Goddess Dressing with my lentils. I just love my leftovers! This will make for a good lunch, too. Now to convince my kids how great lentils are, right? 3. 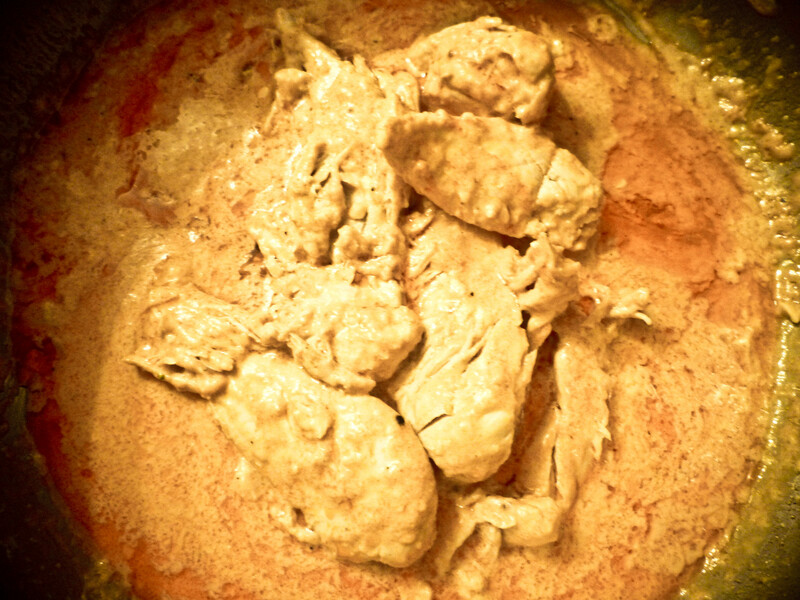 Add curry powder. Add the rinsed uncooked lentils and 4 cups water. Season with a sprinkle of sea salt and pepper, add in lemon juice, and bring to a boil. 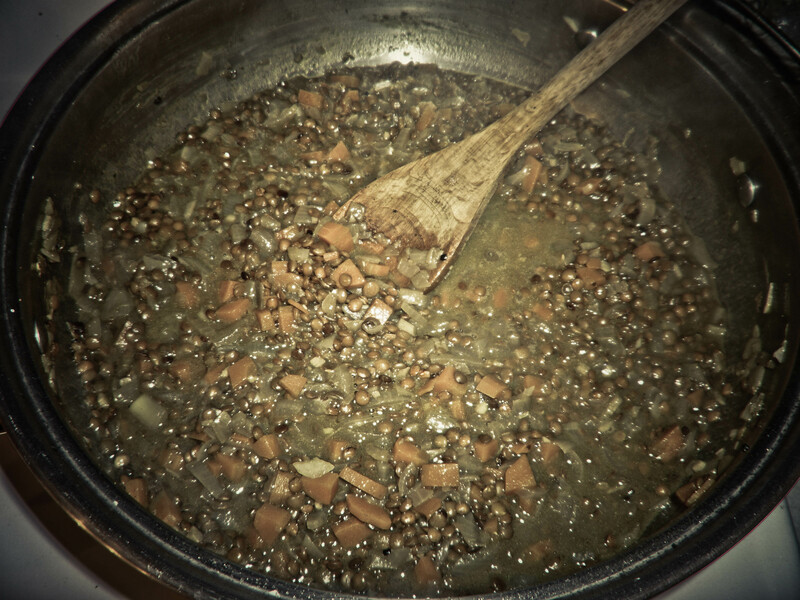 Reduce heat to medium and simmer until lentils are tender, about 30 minutes. 4. 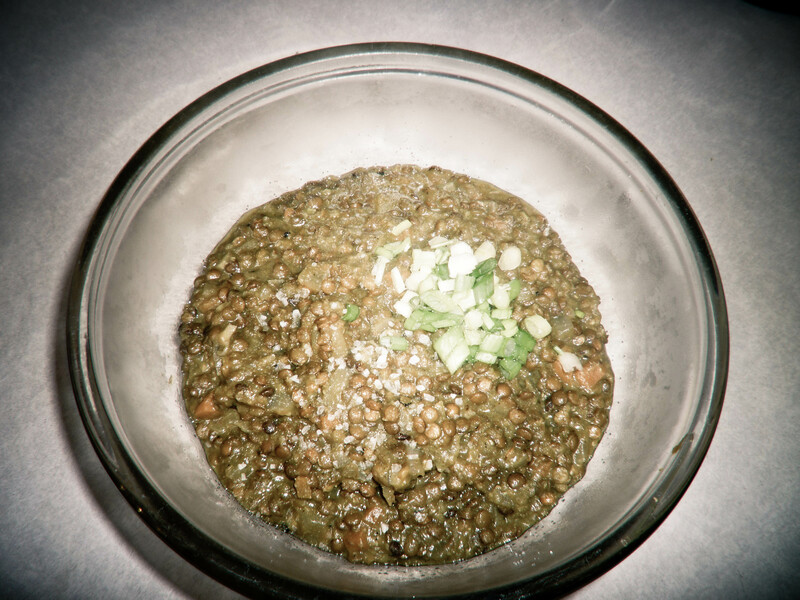 When lentils are tender, poured about half of the soup into the blender and blend the soup for a minute. This will create a very thick texture. After blending, stir the soup back into the skillet/pot and you will have a very thick soup with some chunky pieces left from the soup you did not process. Cook chicken breasts until no longer pink and add seasoning. Once the chicken is cooked, take 2 forks and pull the chicken apart, until it is shredded. Fajitas are best served buffet style, with all the prepared ingredients in separate bowls at the center of the table within everybody’s reach. It is fun to build your own tortilla, you may have to help the kids, if kids are involved, but either way, it is still fun. I also like to eat the salad on its own with the seasoned chicken. It is quite filling.